Open-plan living/dining room with kitchen, and 3 bedrooms (1 double and 2 twins), each with en suite bathroom. Private pool, sun terrace, barbecue, and parking. If an additional bed is required there is 1 folding bed. Villa Cherry can sleep up to 7 people. Villa Cherry has a table and chairs by the pool for al fresco dining, and in the front garden is a barbecue with patio furniture. We loved waking up to the sunrise in the mornings. We had a lovely holiday enjoying the scenery, local food and people. From the first day of arrival at Vila Cherry we were welcomed by Thimios and Anda which made our stay so much more personable. They explained everything we needed to know about the villa and great places to visit. We rented a car for exploring Kefalonia which was a real treat. My sincere gratitude to Agni travel and staff. Had a great holiday and would def recommend but would also suggest a car is needed to get to better beach and sea . Brilliant place to stay lovely quite area with lovely tavernas and very friendly people . Will defiantly be returning . a lovely holiday , villa was just what we needed.Anda the maid & the maintenance man were excellent &very friendly & helpful . Would book again without any hesitation. Great holiday in a lovely villa in a great location. 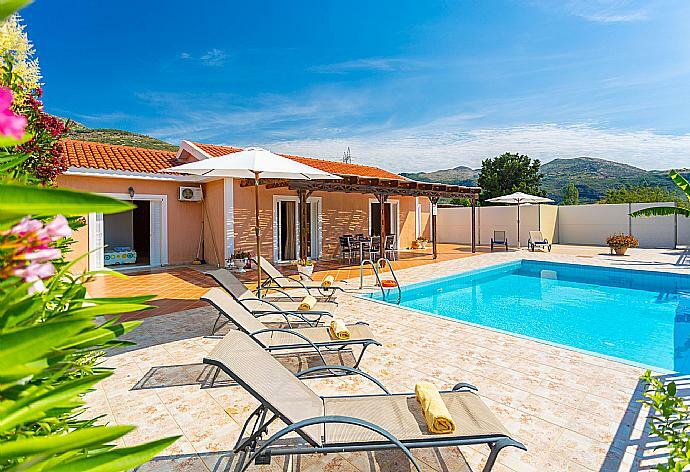 This was our third time at Villa Cherry and our fourth in Katelios Kefalonia with Agni Travel. We have already booked for June 2018 again at Villa Cherry. Villa was in the perfect location for us. Nice and secluded and a good easy stroll to the beachfront. Villa was clean airy and spacious very well equipped and with a good sized pool. Located right next door to Villa Peach and our stay overlapped a changeover in that villa but you wouldn't know either set of neighbours were there. Lovely holiday. Our holiday at Villa Cherry was very relaxing. We arrived in a thunderstorm but were given a lovely welcome by Thimios and Anda. Anda returned on a number of occasions during our stay to make sure we were alright and to check if we needed anything. She kindly gave my partner a lift to the mini market when it was raining. We felt that the service provided by Anda was exceptional. 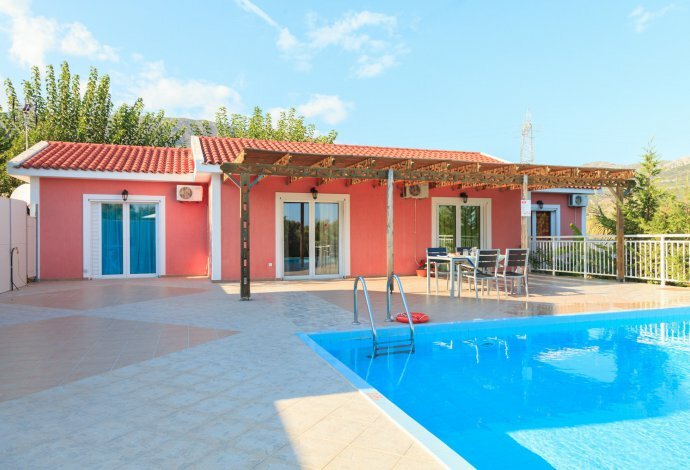 The villa is in a very peaceful setting and the pool area is perfect for private relaxation. We left feeling relaxed and happy with our choice of accommodation. It was a lovely clean and spacious villa and pool. The cleaner was so friendly and helpful. It was quiet but within easy walk of the restaurants. Katelios is really charming and pretty. Agni Travel were excellent and provided us with all the information we needed with the utmost efficiently. Great holiday. Great villa. Great location. Had a fantastic week. Villa was perfect for us. Lovely caretaker and cleaner. Thank you. We enjoyed a great holiday. We love Kefalonia and have for many years. Very impressed with Agni Travel in particular Villa Cherry. The lady who came to do the cleaning was friendly and helpful. We enjoyed it so much we have already booked for next year. Many thanks. We had a very good holiday and have re booked the neighboring villa for our holiday in 2016. This was our second Agni villa on Kefalonia and once again we loved it. Villa cherry was spacious and just what we wanted. Location was great, quiet spot but within 15 mins of beach, selection of tavernas and some nice cocktail bars, mini market and baker were even closer. Loved the country feel. We had a lovely relaxing holiday, spent a lot of time by the pool, read lots of books, ate lovely Greek food especially the tomatoes and are already planning for next year. Agni Travel were excellent in helping us book car hire and would also say that the service they provide once you have booked your holiday is excellent Francesca was especially very helpful. The cleaner and caretaker were very nice people and they could not do enough for us. We were very lucky as one of the restaurant in Katelious opened a couple of days after our arrival (in April) The Medusa, we frequented this for our evening meals, they provide excellent food and very friendly service. So all turned out well, we had a very relaxing holiday we would go back and stay at some point. We would recommend Agni Travel to our family and friends. Excellent villa, Excellent location, Excellent resort, Excellent holiday! Perfect for us. We would say its the best villa we've ever had! Excellent holiday and we look forward to returning when we can! Villa and resort were fantastic. Lovely restaurants. We really enjoyed our holiday, the villa and location were great for us. The paperwork and guides we were sent before arrival were really useful. Our holiday stay at villa Cherry was like a pleasurable dream. It was relaxing, calm and the surroundings beautiful. It was very clean and welcoming. The cleaning was done to a very high standard. The cleaner and maintenance man were so friendly and helpful. The area was lovely and clean, the villagers were polite and welcoming and you felt very safe. All in all a 10 out of 10 holiday. Thank you Agni Travel. We had a great time and everything went smoothly from the moment we collected the car at the airport. The villa was in good condition and the caretaker and cleaner very helpful.Your contact texts were reassuring in case we had any problems and I will recommend Agni Travel to my family and friends. Hopefully you will be able to find us another holiday in the future. Katelios is a sleepy coastal village with sandy beach and small fishing harbour. Katelios is famous for its fresh fish tavernas that line the waterfront. There are several (low-key) bars, a couple of supermarkets and an exchange/car rental office. The beach rarely becomes busy, with the largest number of visitors being the loggerhead turtles who favour the soft sand for making a nest!